Since the African Swine Fever (ASF) is likely to enter Vietnam, the country has decided to halt the import of meat products from Poland and Hungary. The decision was taken due to concerns about the recent discovery of the African Swine Fever (ASF) virus in the two countries’ pigs. The restrictions also apply to live pigs, pig embryos and boar sperm, as well as sheep and goat products. Before the meeting, Deputy Minister of Agriculture and Rural Development Ha Cong Tuan had sent two documents to two embassies of the two countries, announcing the halt of meat import due to the African Swine Fever. 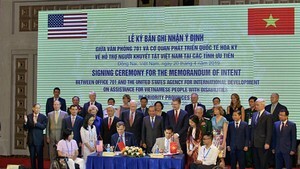 However, the Vietnamese watchdog has still allowed batches of pork products from the two countries which left harbor before September 20, 2018. In the talk to Sai Gon Giai Phong newspaper this morning, acting director of the Ministry of Agriculture and Rural Development (MARD)’s Animal Husbandry Department Nguyen Xuan Duong said in reality, Vietnam buys little meat and meat product from the two country but the US and Canada. Since early 2018 till now, the outbreaks of the African Swine Fever in the two countries has been infecting over 5,440 boars and farm pigs.